Joanna Haas joined Kentucky Science Center as CEO in 2008. Under Haas’ leadership the science center has activated a vibrant “Do Science” brand platform spurred by nationally-recognized Science in Play and statewide collaborations, partnerships and signature programs that push the center’s physical presence to nearly all corners of the state and region. Haas and her team have developed sustainable business practices resulting in diversified revenue streams, including $1 million in new revenue over the last five years alone, and have cultivated a highly envied and productive organizational culture. Prior to Louisville, Haas held executive management positions with a variety of attractions including Carnegie Science Center in Pittsburgh, Ford Motor Company’s Spirit of Ford, and The Henry Ford Museum in Dearborn, Michigan. Her career began at COSI in Columbus, Ohio where over a nearly ten year period she held a number of management positions. Haas serves as a member of the national Association of Children’s Museums Board of Directors and on numerous community boards including Kentucky Science & Technology Corporation, Girl Scouts of Kentuckiana, Greater Louisville Inc. Arts & Cultural Attractions Committee, and the strategic planning committee for Central Presbyterian Church. For more than nine years Haas served as a member of the Association of Science-Technology Centers (ASTC) Board of Directors and as Chair of the Leadership and Field Development Committee of this global association. Haas completed the Getty’s Museum Management Institute program in 2002, Leadership Kentucky in 2015 and Leadership Louisville in 2010. In 2012, Haas received the Roy L. Shafer Leading Edge Award for Experienced Leadership in the Field from the Association of Science-Technology Centers (ASTC). Haas has been published in numerous professional journals including Dimensions (ASTC), Hand to Hand (Association of Children’s Museum), and Museum (American Alliance of Museums). In April 2006, Haas’ family expanded through adoption when Winston Palmer Haas was born. As the Chief Operations Officer, Mike Norman serves as the senior business leader for Kentucky Science Center. He impacts strategic and tactical direction for the organization, helping to bring the strategic vision to fruition. Mike is responsible for the Administrative Services (Finance, Human Resources, Technology, Legal, and Risk Management) Operations, Visitor Services, Rentals, and Volunteers departments. Mike holds a BS in Business Administration and MBA from the University of Louisville. Prior to joining the Science Center, he spent ten years as Director of Internal Audit for Louisville Metro Government. 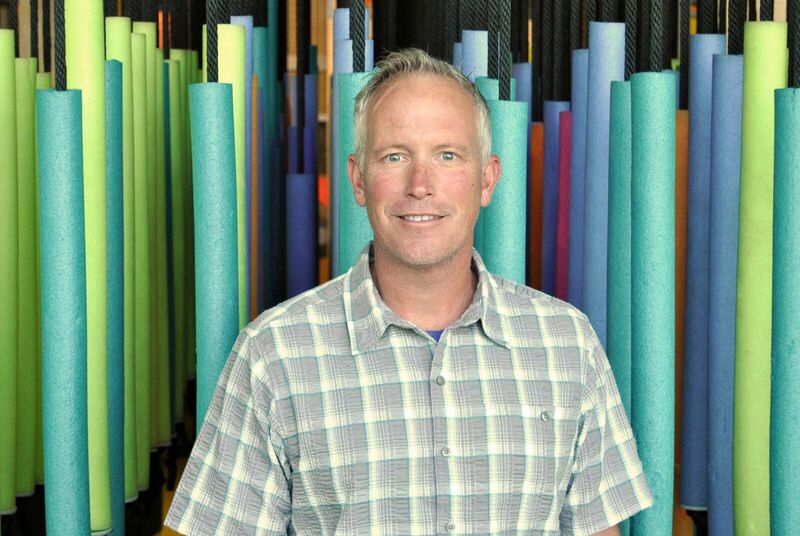 Since joining Kentucky Science Center in April 2011, Mike has been involved in a number of dramatic improvements, including conversion of the IMAX Theater to a digital, 3D-capable facility, and the installation of Science in Play. Mike is most proud of his involvement in developing the “Unbridled Science” strategic plan. As a life-long Kentuckian, he’s extremely grateful to have been part of the Science Center’s transition to the “State Science Center,” and seeing the increasing impact across the Commonwealth. When he’s not Doing Science, Mike enjoys spending time with family, especially in the form of outdoor activities such as hiking, biking, kayaking, or napping in a hammock. He dreams of being a professional golfer… the only factor holding him back is an extreme lack of golf talent. 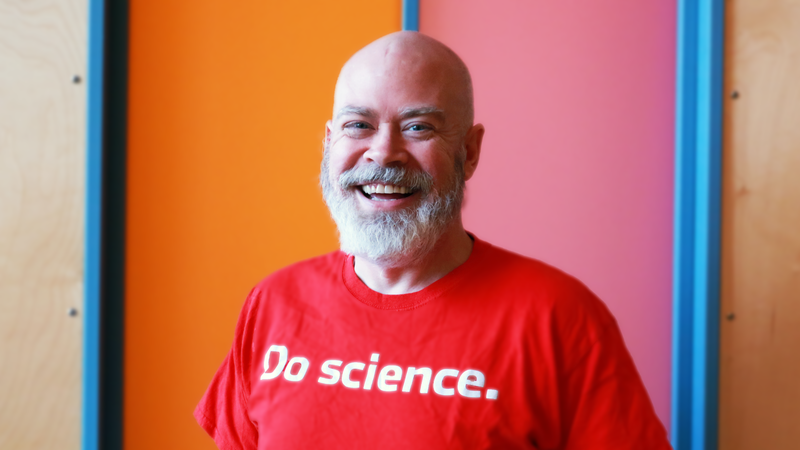 After joining the Kentucky Science Center team in 2017, Dave now serves as the Director of Brand Advancement, overseeing all aspects of the Science Center’s external affairs, including marketing, communications, special events, membership, and fundraising. He’s also responsible for community development throughout the state, and government relations at the state and local level. 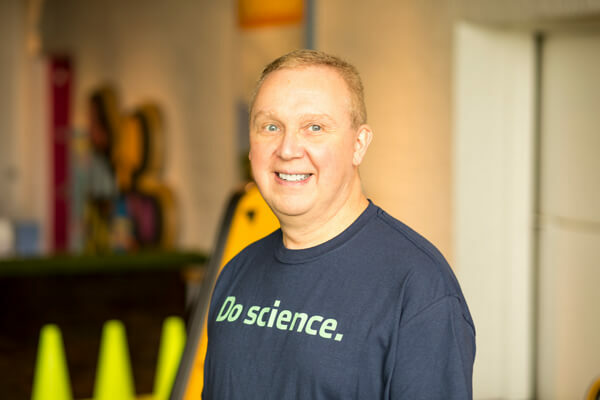 Dave joined Kentucky Science Center after a twenty-year career with the YMCA, where he began as a summer camp counselor. For the last 10 years he’s been serving in an executive director capacity and brings great leadership and nonprofit experience to his current role. With three young sons who love Kentucky Science Center, Dave has a daily reminder of the organization’s mission and is often here on his days off. When he’s not Doing Science, he can be found at his children’s sporting events, or running or biking around Cherokee Park. 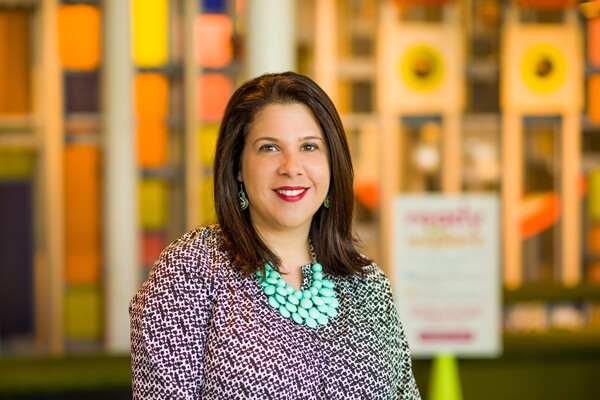 As the Director of Programs & Partnerships, Mellisa Blankenship provides visionary leadership in the development of Kentucky Science Center programs and experiences. She’s also responsible for cultivating innovative and collaborative partnerships–locally, regionally, and nationally. Mellisa is a scientist herself, holding a BA in Biology from Indiana University Southeast. 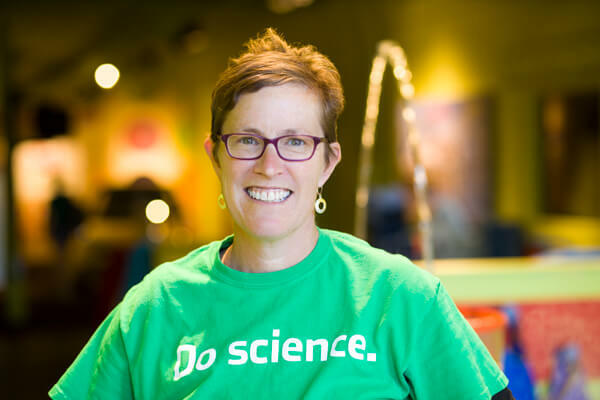 After seven years at the Science Center, she feels most proud to have fostered some incredibly engaging and rewarding partnerships all over the state–community partners who share our passions for engaging, entertaining, and enriching the lives of children. These relationships have given her a profound appreciation for all that our community has to offer, and for Kentucky’s welcoming, giving nature. When she’s not Doing Science, Mellisa spends her free time exploring the outdoors with her two young sons. They love to imagine that they’re on a wild adventure uncovering a lost city or finding an elusive creature. Her boys keep her imagination active, and their curiosity drives her to create new and exciting programs that her sons would love. As the Director of Great Impressions, Toph Bryant oversees all support activities at Kentucky Science Center, including Volunteers, Admissions, Retail, Theater, Exhibits, Operations, Security and Events. Toph has over twenty years of leadership experience in independent flagship retail in New York City and New Orleans. He has served on the executive board of the Louisville Independent Business Alliance and is passionate to promote all the unique qualities of this fantastic city. Toph has been honored to serve as the chair for the Visitor Services Community of Practice for the Association of Science – Technology Centers and to serve on ASTC’s Leading Edge Awards committee. He loves to talk about how to Be Great. The service philosophy crafted for Kentucky Science Center. When Toph isn’t Doing Science, he is somewhere taking photographs of trees. Toph is a curiosity mentor, ontological thinker, and nemophilist who is easily distracted by shiny things and inspired by literature, poetry and art. 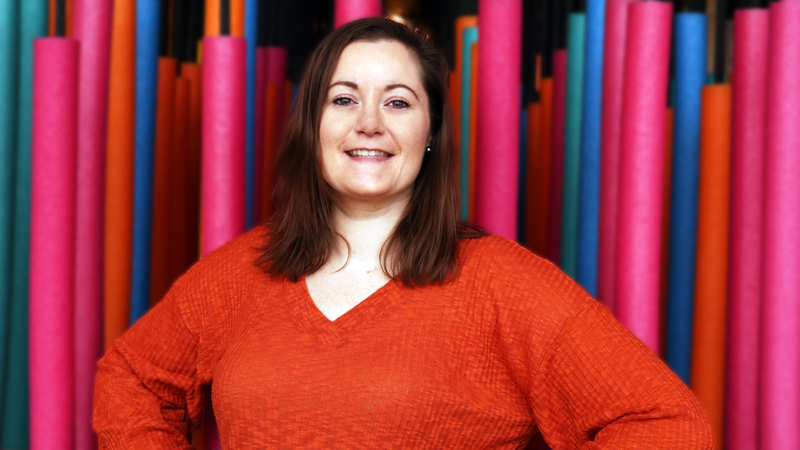 As the Senior Manager of Finance and Administrative Services, Becky is responsible for establishing, maintaining, and directing the overall administrative functions necessary for the proper and efficient operation of the Kentucky Science Center. This includes leadership of the finance and human resources functions of the Science Center. Becky is a graduate of Miami University in Oxford, Ohio, and holds an active Certified Public Accountant license. When she’s not Doing Science, Becky enjoys hanging out with her husband and two children, volunteering at her church, and following Ohio State football. 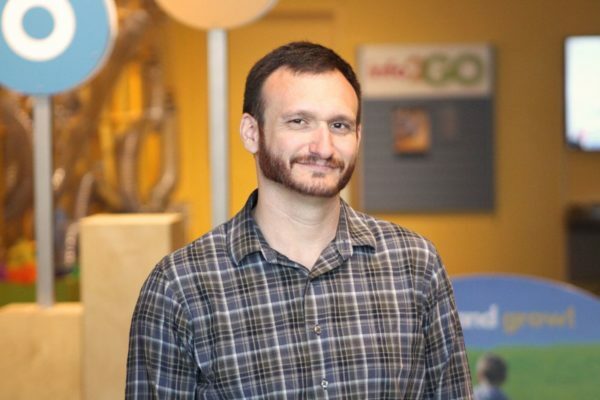 As the Senior Manager of Marketing and Communications, Ben Goldenberg directs all activity for the marketing, advertising, communications, PR, and membership functions of the Kentucky Science Center. Ben holds a BA in Telecommunications from Ball State University and an MBA from the University of Louisville. Prior to joining the Science Center, he was the marketing director for the Jewish Community of Louisville and a producer at WHAS 11. When he’s not Doing Science, Ben enjoys spending as much time learning from the outdoors as possible by backpacking, hiking and kayaking or riding or working on a bike. 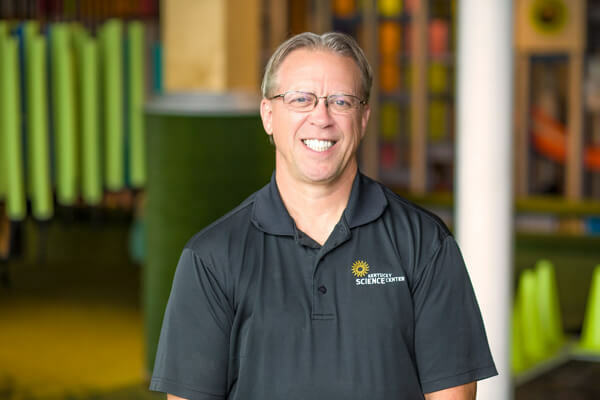 As the Senior Manager of Operations, Richard is responsible for maintaining and managing the daily physical operations of the Science Center. This includes the building itself, all of our interactive exhibits, equipment, and security. Richard is a Certified Facility Manager through the International Facility Management Association. Through his involvement with the local IFMA chapter, Richard helps chapter members earn their own Facility Manager certifications. Richard has also served as the Chair of the Louisville Energy Alliance, which promotes energy efficiency and conservation. When he’s not Doing Science, Richard is an avid backpacker, and has hiked many different sections of the Appalachian Trail. He also loves to be on his road bike, and is proud to have completed the RAIN (Ride Across INdiana): a 160-mile bike ride across the state of Indiana, completed in one day. 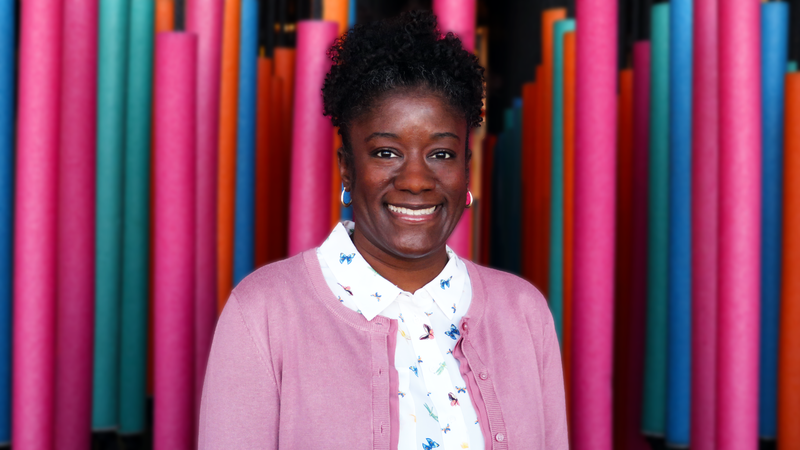 As the Senior Manager of Exhibits, Starr Peters works with the Operations department to maintain and improve all of the interactive exhibits both in and out of the building. Starr manages travel for the Science in Play2Go exhibit as it journeys to libraries around the state, and works with both internal and external partners to develop and implement new exhibits and experiences for Science Center guests. Starr holds a BA in Theatre Arts and Drama from Washington State University. She worked as a Stage Manager and Technical Director and dabbled in light, sound, and costume design before discovering the behind the scenes world of the Kentucky Science Center in 2010. When she’s not Doing Science, Starr is frequently at a circus gym working on juggling and partner acrobatics to trick herself into exercising. She also spends time playing in as many museums, science centers, and parks as she can get to. 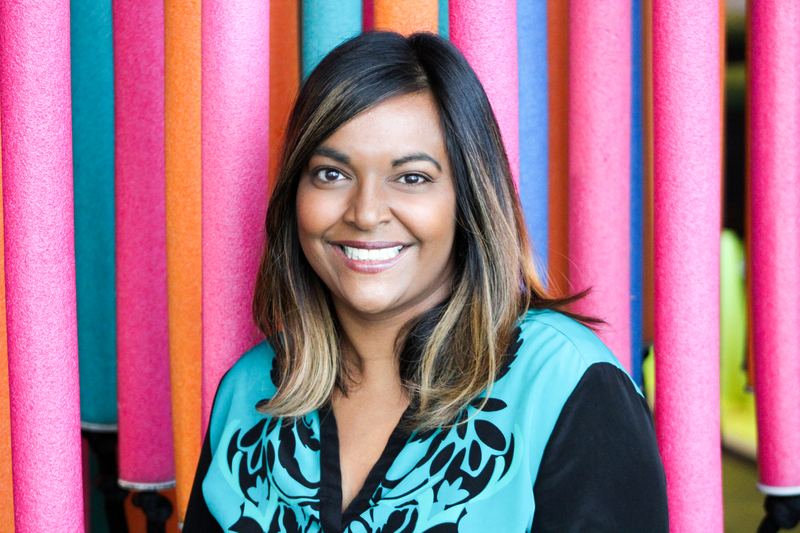 As the Senior Manager of Visitor Experience, Mira is responsible for heading up enthusiastic Visitor Experience team who oversee programming both in the building and out, around the state and region. This also includes building amazing partnerships and collaborative experiences for all our visitors. Mira holds a BS in Biology from Centre College and MS from University of Louisville. She has been a part of the education team at the Kentucky Science Center for 9 years. Prior to Science Center, Mira did environmental education at the Cary Institute in New York. When she’s not Doing Science, Mira enjoys spending time with family in both Western Kentucky and Eastern Kentucky, trying out new recipes, traveling to new places and exploring the outdoors. 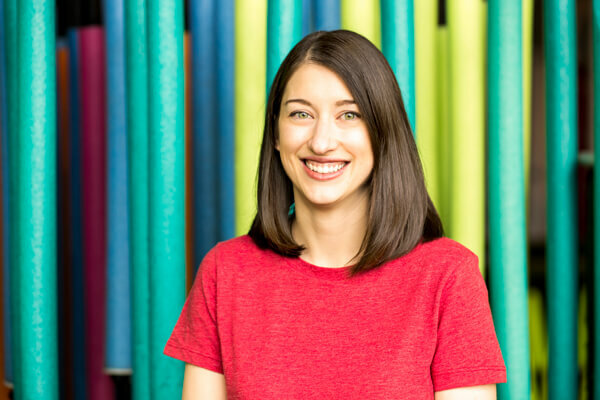 As Senior Manager of Philanthropy, Katina provides direction and leadership of the Science Center’s annual fundraising goals which includes donor cultivation, solicitation, and stewardship; special events and sponsorships. Prior to joining KSC, Katina has served in various leadership positions in non-profit, government, and corporate organizations. She has more than a decade of non-profit and academic fundraising experience. A graduate of the University of Louisville, she has Bachelor of Art degrees in Communication and Spanish with a Pan African Studies minor, and a Master of Arts in Communication. When not Doing Science, Katina serves on local non-profit boards, is an active member of her church, and loves to travel.